Butternut squash in a cake? Why not! 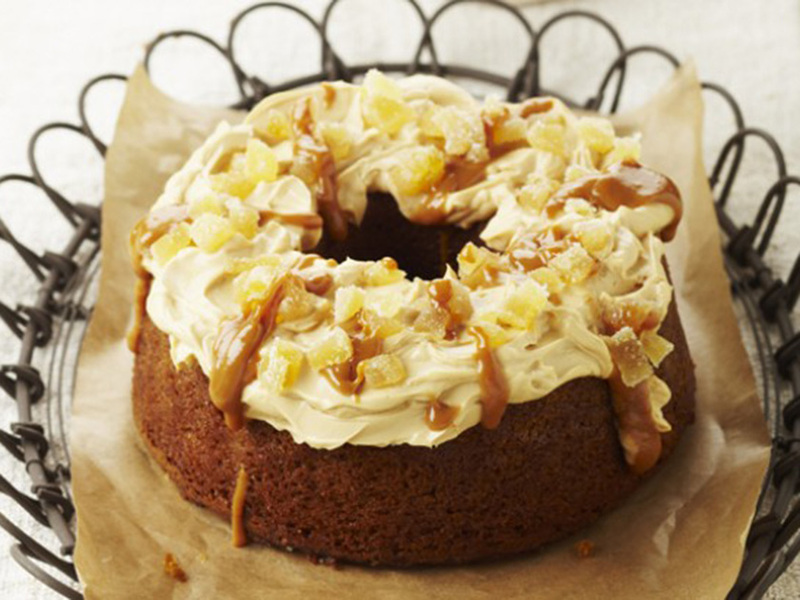 This delicious recipe is topped with caramel and ginger frosting for a great winter taste. Set the oven to Gas Mark 4 or 180°C. Put the squash flesh into a large bowl with 1 tablespoon water. Cover with cling film, pierce the film a few times, then microwave on High for 8 mins. Alternatively, cook in pan with 4 tbsp water for 15 mins, then drain. Use a hand-held stick blender to blend the pumpkin flesh until smooth. Put the oil, sugar and eggs in a large bowl and whisk together, using a hand-held electric mixer, until thick and pale. Fold in the flour, bicarbonate of soda, and spices. Gently stir in the pumpkin purée. Spoon the mixture into the prepared tin. Bake for 50 mins, or until a skewer inserted into the cake comes out clean. Leave the cake in the tin for 5 mins. Run a knife around the edges and turn cake out on to a wire rack to cool. To make the frosting: Mix the cream cheese with 4 tbsp of the caramel (either by hand or in a food processor). Spread this over the top of the cake and sprinkle with chopped ginger. Put the rest of the caramel in a jug, stand this in a pan of water, or microwave it on High for about 30 seconds until it softens. Drizzle some of the caramel over the cake, to finish. Serve the rest of it alongside as a sauce. Loosely wrap cooled and decorated squash cake in cling film, then put into a sealed freezer-proof box for up to 1 month. Defrost at room temperature for 2 hours or overnight in the fridge.